Everyone wants to start the year strong; unfortunately, most people don’t really know where to begin. Most start with high hopes and unrealistic expectations and then abandon their goals before the confetti has time to settle. My theme for 2019 is simplicity. When I was younger and new in the field, I thought I had to impress people with how much I knew or how much new information I could throw at them. 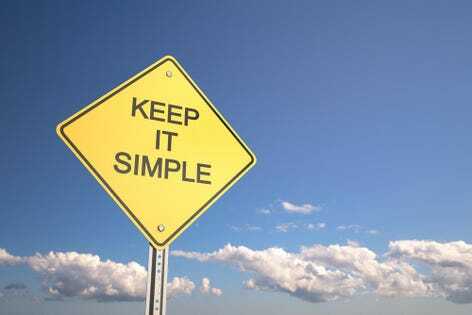 The older and more experienced I get, the more I realize how impactful and effective it is to keep things simple. At the end of the day, my clients and audiences are happy when they get results, and results are exactly what simplicity delivers. Let’s focus on a very simple and effective 3-step method of starting the year out with tremendous momentum and—here’s the hard part—keeping it up. Step 1—FORGET: Over the last few weeks, I am fairly sure most of us have eaten too much, allowed ourselves a little more than usual to drink, and heard all kinds of good advice on how to get the new year off to a great start. Starting today, I want you to FORGET what you have done and heard. Forget the good, forget the bad, and please forget all those New Year’s resolutions you have made. I want you to begin 2019 with a clean slate. Forgetting 2018 will actually help you get a more strategic beginning to 2019. Step 2—ATTACK 2 THINGS: Choose your 1 most important activity for your professional success this year, as well as the single most important activity that will promote success in your personal life. Yes, I know that you probably have several extremely important activities you want to tackle for your professional and personal success, but I know from experience that most people pile their “wish lists” so high that they end up neglecting the most important activity. Keep it simple. Force yourself to stick to one activity for your professional success and one for your personal success. Professionally speaking, this year I am going to spend 30 minutes each morning writing (I have a new book coming out at the end of 2019, and committing 30 minutes daily will go a long way toward putting together a really strong product). On the personal side, I am going to commit to taking my wife on a date at least three times monthly and also having one date with each of my kids every two months (I have found these 1-on-1 dates to be very effective at keeping my marriage strong, as well as helping me stay connected to my children). Step 3—REPEAT STEP 2: For simplicity sake, we are not going to worry about a third step. If you will crush your two most important activities consistently (one professional and one personal), I guarantee you will create great momentum and sustainability for having a successful 2019. Remember, success doesn’t need to be complicated. Let’s keep it simple this year. Make these two activities your number one priority. I challenge you to write down on paper the two activities you are going to attack. Once you have your two commitments written down, next I want you to post them on a wall some place where you will see them daily. Finally, take a moment to block off in your calendar the days and times each month you will complete them. Doing so will help you remember and execute. Don’t skip this step. Start nailing your two commitments immediately, and you will like the momentum it creates toward having a great 2019. This will not be easy, but you can do it. If you get off track…FORGET…and then get back on track and attack your commitments immediately. This year, I challenge you to commit to simplifying.